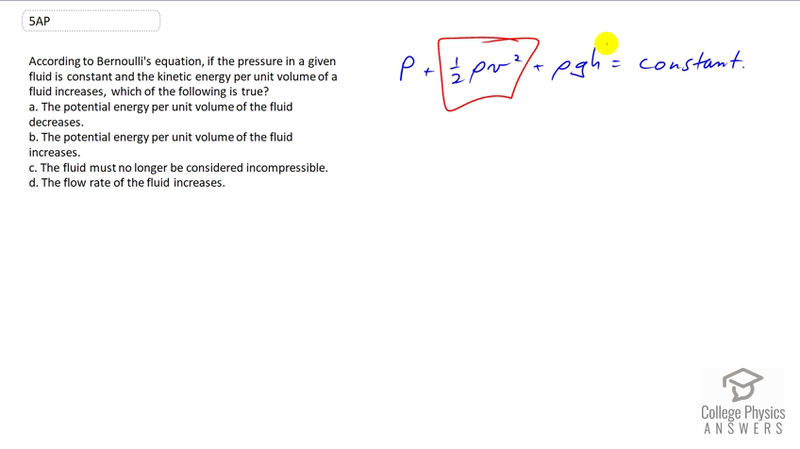 According to Bernoulli's equation, if the pressure in a given fluid is constant and the kinetic energy per unit volume of a fluid increases, which of the following is true? The potential energy per unit volume of the fluid decreases. The potential energy per unit volume of the fluid increases. The fluid must no longer be considered incompressible. The flow rate of the fluid increases. This is College Physics Answers with Shaun Dychko. Bernoulli's equation says that the pressure in a fluid plus this kinetic energy per unit volume plus a potential energy per unit volume equals some constant. Now this question is saying that the kinetic energy per unit volume increases. So that means this term increases. So in order for this whole thing to be constant, that's going to have to result in a corresponding decrease in this term. And so that's going to result in a potential energy per unit volume of the fluid decreasing. So the answer is a.